Times are busy at the moment, I’m cooking but I have no time to write here, which makes me sad. I try though, I try. This is a tasty tasty dish, and so easy to make. I’m a fan of all the ingredients in this, and being vegetarian friendly definately helps. Of course, a bit of meat could easily be added to this! Don’t ask me what though, I wouldn’t have a clue. But if you’re a fan of the meat, don’t be put of this dish because of the lack of it. 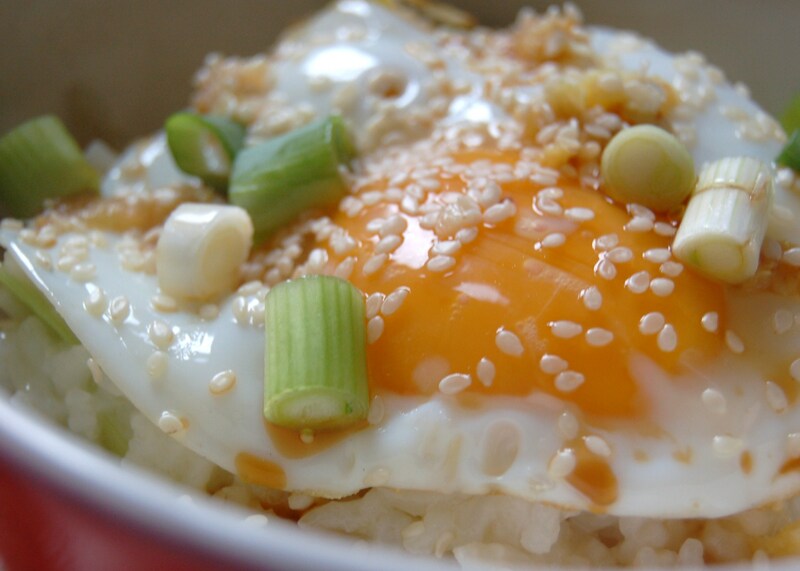 The stickyness of the rice along with the egg, ginger, garlic and leeks (don’t forget the spring onions too!) makes it so moreish – It made me go back for seconds thirds. 1. Add the rice to a pan of boiling water. This needs to be OVERCOOKED to become sticky, so keep adding more water and cook for about 15-20 minutes until the water around it has become sticky. 2. In a pan over a medium heat, add 1 tablespoon olive oil, garlic and ginger. Keep stirring while it cooks until brown; then transfer to paper towls to absorb the oil. 3. Reduce the heat slightly, and add another tablespoon olive oil with the leeks. Cook for 7-10 minutes until nice and tender. 4. When the leeks are done the rice should be too. Add the rice (there shouldn’t be much excess water by now, but if there is just drain it) to the leeks and take off the heat. 5. In a hot frying pan add a tablespoon of olive oil and fry the eggs. 6. 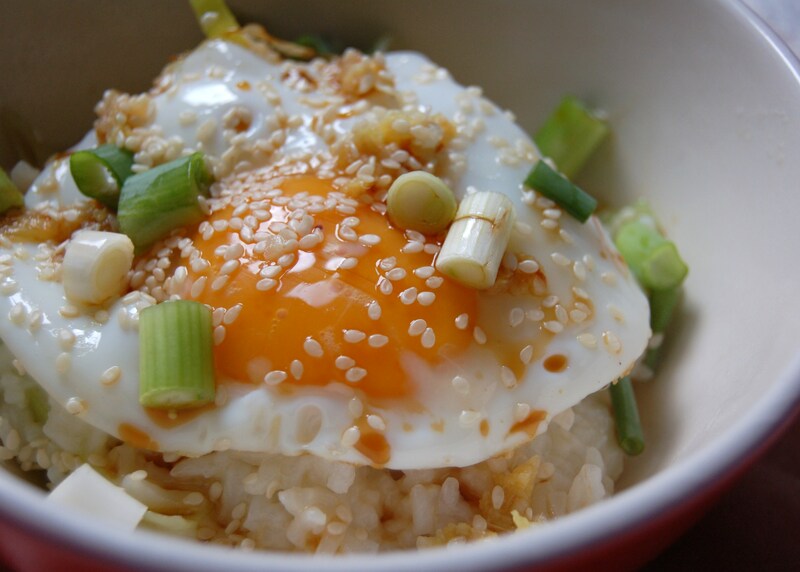 Divide the rice and leeks into two bowls, and top each with an egg. Add soy sauce, crisped garlic and giner, and spring onions. Serve! What a yummy yolk! Also love the sesame seeds! Thanks, I love sesame seeds, they really make a dish! It’s oh-so-easy too, definately a last minute supper! Just wanted to let you know you have a beautiful blog, your pictures are great. 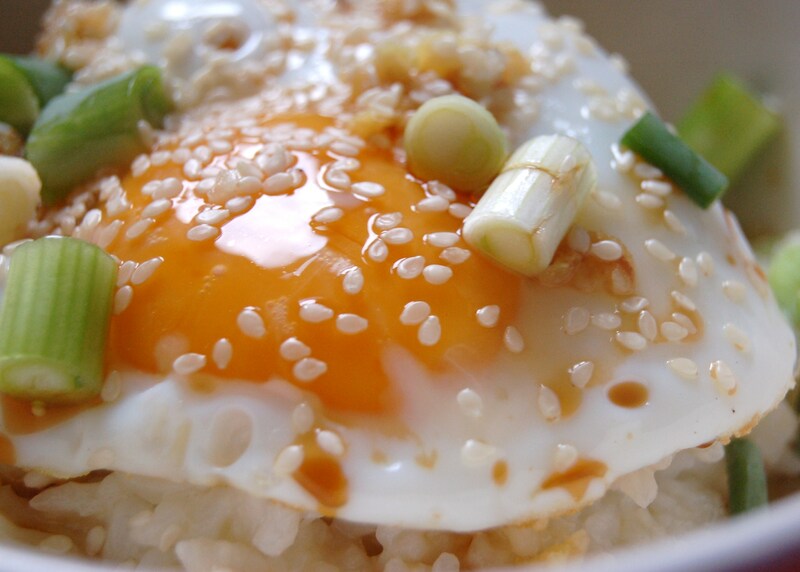 I love sticky rice fried rice, i just did a thai fried rice and always use sticky rice. Gorgeous photo, and I think this is perfect without any meat!